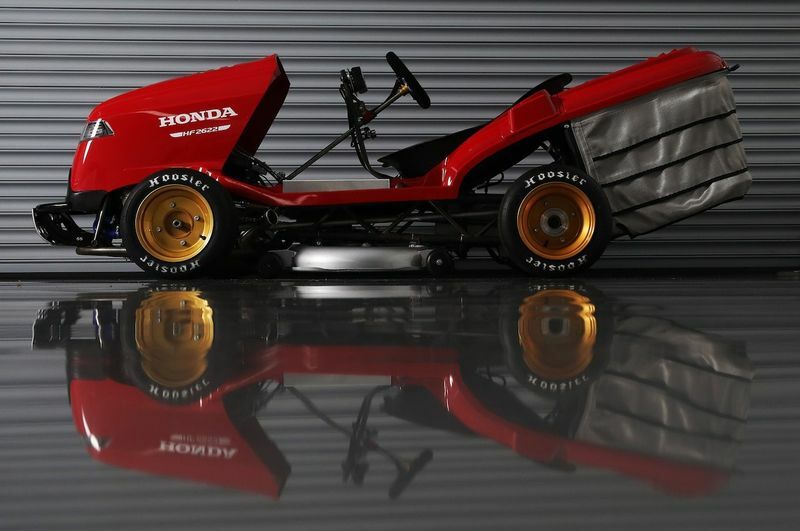 Back in 2013, Honda set out to build the world's fastest lawnmower. Seems like quite a pathetic accomplishment, yet so cool at the same time. It did just that with the Mean Mower, a Honda HF2620 lawn tractor fitted with the engine from a Honda VTR Firestorm sport bike. Honda captured the lawnmower speed record in 2014 with a run of 116.575 mph, or 187.61km/h, which is some serious speed, even for road cars. But that feat has since been surpassed, and Honda is eager to retake the title of fastest grass-cutter with its improved Mean Mower V2. But before it does that, the company decided to run its latest creation up the hill at the Goodwood Festival of Speed, and that ambitious attempt will definitely make headlines! The Mean Mower V2 is built on a custom T45 steel chassis and packs the beating heart of a CBR1000RR Fireblade SP – a 999cc inline-four that produces more than 190 hp. Mechanically speaking, the custom build has little in common with Honda's off-the-shelf mowers, but it still shares its front cowl, body panels, and grass box with the HF 2622 lawn tractor. Weighing just 152 pounds, Mean Mower V2 is estimated to be capable of speeds in excess of 150 mph, or 242km/h, which will trim your backyard in no time! Though Mean Mower V2 can't use that outright speed on the Goodwood Hillclimb course, you can tell it's plenty quick. You can also tell the vehicle, which has no suspension, is a pretty bumpy ride. The run up the hill is short and sweet, but it gives us an idea of what Mean Mower V2 is capable of before Honda attempts to break the lawnmower speed record at some point in the future. Que the VTEC memes! Video: A Hillclimb Event And A Mixed Bag Of Unusual Cars Tackling The Conditions In Their Own Unique Way! ' Buckle Up Baby, Let's Drive! Video: Unruly Predator Racecar Dominates This Hillclimb With Its F1 V10 Engine!